Sector of Uttar Pradesh State. For UPPSC Polytechnic Lecturer Recruitment candidates must be a Engineering/Technology Graduate and Hindi Speaking knowledge. For UPPSC Polytechnic Colleges Non Engineering Lecturer Jobs candidates must have completed M.Sc or PG. Total 1248 Lecturer vacancies in 24 subjects of UPPSC Polytechnic Lecturer Recruitment 2018 and 13 Principal vacancies in this recruitment 2018. UPPSC is recruiting this lecturer jobs in Government Polytechnic Colleges of Uttar Pradesh State. Selection for UPPSC Polytechnic Lecturer Vacancy Recruitment will be through Screening Test (written exam), merit in qualifying exams and Interview. Last date for submission application form online for this UPPSC Govt Polytechnic Colleges Lecturer Jobs is 30-01-2018. For more details regarding Uttar Pradesh PSC Polytechnic Lecturers Jobs of Technical Education Dept Govt Polytechnic Colleges required qualifications, selection process, no of vacancies subject wise, age limits, how to apply online application and more details are given below. Most vacancies are in the subjects of Computer, Electrical, Mechanical,Electronics, Civil Chemical, Maths, Physics, Chemistry and Textile Engineering. Vacancy Notification for UPPSC Lecturers Jobs in Govt Polytechnic Colleges of Diploma Sector. 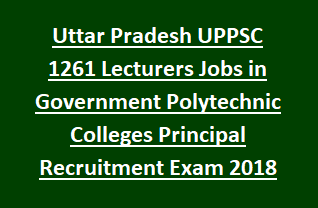 There are total 1261 Lecturer and Principal vacancies available in this latest govt jobs recruitment of UPPSC Government Polytechnic Colleges of Technical Education Department of UP. For Polytechnic Lecturer Jobs in UP Technical Education Department Engineering Branches Candidate must completed B.E or B.Tech with 55% of marks. Must have known Hindi. For Polytechnic Principal jobs candidates must have qualified B.E or B.Tech and 10 years of teaching experience is required. For SC/ST Processing fee is Rs.25 and Exam Fee is Rs.50/-. Last date for fee payment is 25-01-2018. The selection for Lecture Jobs through direct recruitment shall be made by the UPPSC on the basis of Screening test or Interview, However the UPPSC will conduct a Screening Test to shortlist the candidates for Interview. Screening test or written exam dates are issued later by UPPSC after completion of online application process. Download Exam Pattern and Syllabus for UPPSC Govt Polytechnic Colleges Lecturer Jobs of Computer, Electrical, Mechanical,Electronics, Civil, Chemical, Maths, Physics, Chemistry Subjects PDF format. Probable Exam Syllabus for all the Posts is Diploma Level Only. To test your knowledge they may ask your Engineering or MSC level syllabus questions. Application form will be available online from 30-12-2017 and last date is 30-01-2018. Submit application form online at UPPSC official website of @www.uppsc.up.nic.in. what would be syllabus for civil engineering??? WILL WRITTEN TEST BEFORE INTERVIEW?? Syllabus will be updated in UPPSC website after completion on online process. If UPPSC decided to conducted an exam else only based on merit and interview candidates will be selected. It is depends upon the applications received to UPPSC. For temporarily you can prepare general knowledge syllabus and you engineering stream Diploma level syllabus.. Nature of post is gazetted/Temporary. What does it mean? It means either regular or temporary basis. Most probably these vacancies are permanent only. Online application form is not opening, suggest any proper link to open the online application form. I completed M.tech in December 2017.In preferential qualification I kept the option Yes as I have Made.tech qualification .I didn't get my pc till now.What I can send instead of M.tech PC ? I think you are having the semester wise marks memo, send those. And M.Tech is not mandatory. But preference will be given at the time of interview..By the time of Interview u will get ur Provisional Certificate. What will be syllabus of mechanical engineering. Officially syllabus is not at released..probably syllabus will be Diploma level mech subject and General knowledge related to UP, Hindi Lang, English, arithmetic and reasoning. Syllabus not at released officially. Probable syllabus topics are Diploma Level Electronics Subject and UP GK, Hindi, English and General Awareness along with Reasoning/Arithmetic..
u.p domacil form ka sath bhejna ha kya ya bad ma kam ayega plz help. you need to send all the documents alongwith application form..
when will be approxminate month of interview?? what will be the approximate date or month for interview? Other state people can apply or not? wat is exam date for written exam for lecturer post. Yes written exam will be conducted. Syllabus will be diploma level.. exam date is difficult to say.. Yes. You're going to teach poly student. To test your knowledge they will ask questions from Engineering level also. But not sure..after official announcement only we can say..
hi swati no new updates. But one thing is sure that they are going to conduct a written exam for Polytechnic colleges lecturer posts. Exam dates and official syllabus yet to announce. Exam Syllabus is same for all competitive exams which are conducted by UPPSC. For technical subject syllabus will be Polytechnic level only. Sorry syllabus is B.tech level . But Questioning standards or difficulty is polytechnic level. Bcoz you are going to teach polytechnic students.